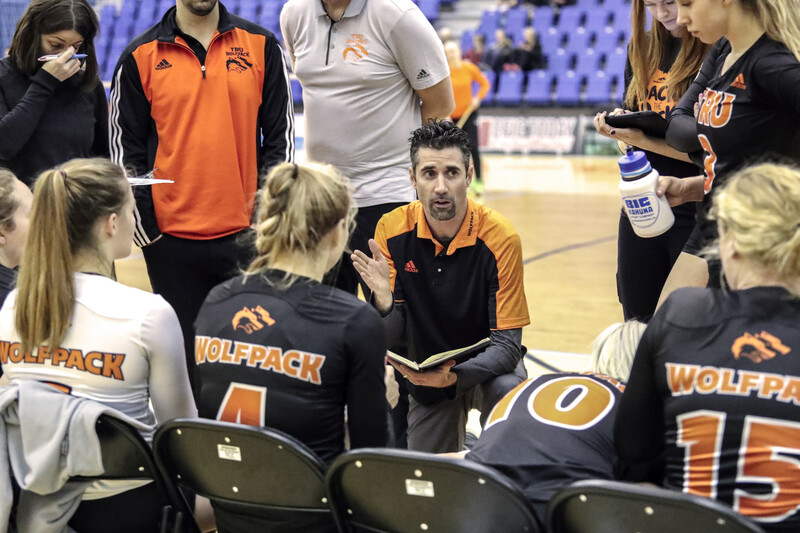 The WolfPack women’s volleyball team went 1-1 against the University of Manitoba Bison in two intense and exciting five-set thrillers. The women beat the Bison 3 sets to 2 on Nov. 24 at the Warner Rentals Court at the Tournament Capital Centre in Kamloops. The ’Pack started the game with strength and confidence, winning the first set 25-19. Manitoba rebounded however, and won the second set 25-16. TRU started the third set in similar fashion to the first and won 25-20. The Bison, not willing to be outdone, won the fourth set 32-30 in a fiercely contested match. TRU managed to close the game out winning the fifth set 15-9. Top performers for the WolfPack were Yevgeniya Nyukhalova, (first-year, outside hitter, Severodonetsk, Ukraine) with 30 kills in 77 swings, 10 digs and 2 block assists, Rachel Windhorst, (fourth-year, outside hitter, Surrey, BC) 21 kills in 63 chances, 3 service aces, 14 digs, 4 block assists. TRU must have wanted to carry the momentum built from this game into the second match-up but lost out in a topsy turvy contest 3 sets to 2 on Nov. 25 which was gain played at the Warner Rentals Court.. Unlike the game that had been played 24 hours before, TRU seemed in control of the contest after winning the first two sets 25-23, 25-21 respectively. In the third set TRU came close to victory with the game tied at 22 all but unfortunately, the ’Pack could not close the game out. What seemed like a routine victory turned instead into a massive collapse. The Bison won the third, fourth and fifth sets, 25-22, 25-17, 15-10. It was a shocking development that left the crowd silenced. With each service, the ’Pack seemed to grow increasingly fatigued unlike the Bison who seemed to become more energized. Despite the loss TRU did have some good performances. Rachel Windhorst (fourth-year, outside hitter, Surrey, BC) had 21 kills in 65 swings, 16 digs and one service ace and Yevgeniya Nyukhalova (first-year, outside hitter, Severodonetsk, Ukraine) had 19 kills in 66 swings, 16 digs and one solo block. TRU head coach Chad Grimm spoke to The Omega following the contest and expressed his belief that fatigue played a part in the result but still gave credit to Manitoba. He lamented the fact his ladies couldn’t close the game out in the third when the teams were tied at 22 all. Coach Grimm also spoke about the importance of mental strength and focus, “It’s difficult finding that mental focus for such a long period of time for two nights in a row,” he said. After this weekend’s results TRU is 5-5. Ironically, so are the Bison. It’s a fitting outcome for two teams who just split a pair of five setters.